For 20 years John has created video and digital media projects for an impressive range of clients in the north and nationwide. Freelance rates with small projects starting from just £400 and discounts for charities/non-profits. Home-studio with world's fastest 1Gbps upload speeds for quick and easy client sharing from approval of roughcuts to final edit delivery. Wide experience from filming corporate/industrial on the factory floor to documentaries on windswept mountain tops and even period costume drama! motion graphics for animated branding, menus and explainer videos to stunning compositing and vfx. Three pro HD & 4k cameras, portable studio backdrops (inc greenscreens), extensive lighting kit, radio mics, timelapse cameras, track, jib etc. DVD authoring with advanced experience in custom animated menus and special programmed features. 20 years of trusted associate CGI/3D animators, composers, web/app/kiosk software developers etc. If you have a video project in mind, large or small, please get in touch! And you can quote me on that!" I started 'Lunar' in '96 after graduating in arts/media at Newcastle and I'm still thriving here 20 years later! My home-studio sits in the beautiful Lune Valley between the Lake District and Yorkshire Dales, but just 5 minutes from the M6. 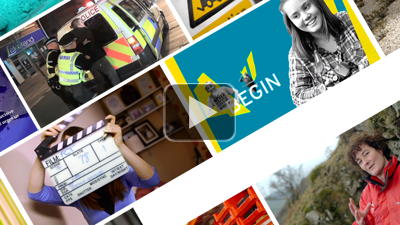 I've worked on a massive range of video and digital media projects for clients of every size and shape; from sole traders to SMEs, national NGOs and international brands. Outside of commercial practice I work on occaissional indie film shorts and documentaries. My short film The POW screened at festivals in Moscow, Dublin, Bucharest and beyond winning awards including Best Cinematography and Viewers' Choice. With the world's fastest 1000Mbps broadband fibre connection installed in 2013 I can upload rushes daily for quick client approval, and even publish feature length HD and 4k films quickly to YouTube etc.